Microcontrollers are small computers that take inputs from our physical world through various sensors and uses that information to control or trigger other actions. They are often embedded in the products we use everyday and with wireless communications and the capabilities of the Internet, they can be used to to interact with devices at a location far distant from the controller itself, also referred to by some as the Internet of Things (IoT). Examples of microcontroller projects include robots that move towards or away from light, smart devices that allow you to monitor your home security or environmental controls with your phone, or even text your company’s coffee maker so that you have a nice fresh cup of coffee when you arrive at work! Kelsey (left front) mentors a student and an interested audience. Kelsey brought various modules for the kids to work with. 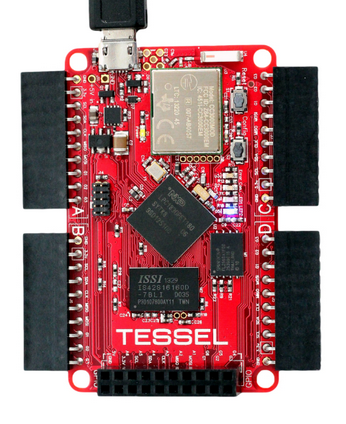 There are many more modules available that work with the Tessel. Visit their site to learn more and get suggestions on how to use them. Camera – gives sight to the Tessel by taking pictures! Servo – control up to 16 hobbyist/RC servos to make things move! Kids worked in pairs making brainstorming experiments with the Tessels more interesting and any problem solving more collaborative. They played with sensing the light and sound in the room, changing temperatures measured by the climate module by testing heat variance near the cafeteria coffee pot (kids are ingenious aren’t they? ), taking pictures with the camera modules, and sending texts to themselves with various combination of modules with tessel’s wifi capability! Tessel Gets A Thumbs Up! Michael and Reilly partnered to send texts using an RFID. 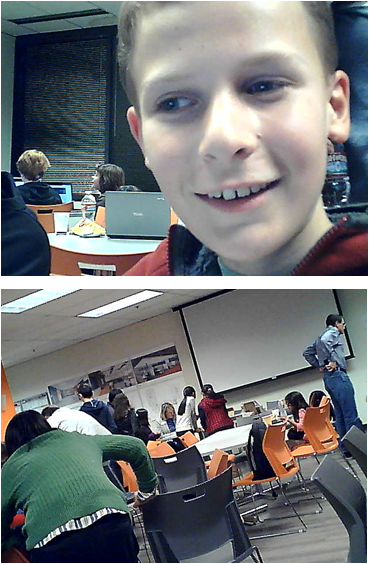 “The session on Tessel microcontrollers was a great learning experience for the kids. Each project was related to a real world application which gave them a better understanding of how technology is used in their every day lives. The kids built some really cool things and it was great to see them experimenting to see what else they could build.” – Bryan, parent. “I had a lot of fun learning how to use the Tessel micro controllers. We built a really cool RFID card reader that connected to a texting service. Every time I swiped the RFID card, it sent a text message to my friend’s phone. 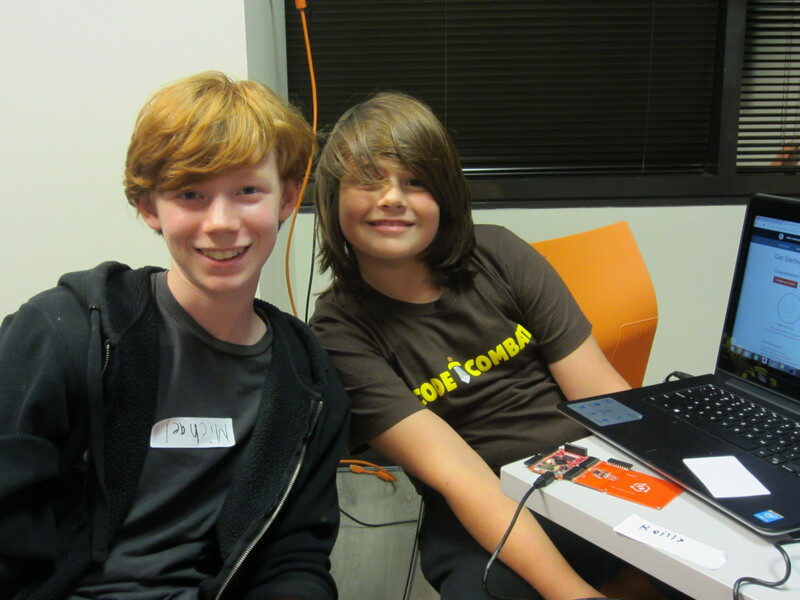 And the best part was I got to code while hanging out with friends” – Reilly, 11 years old. 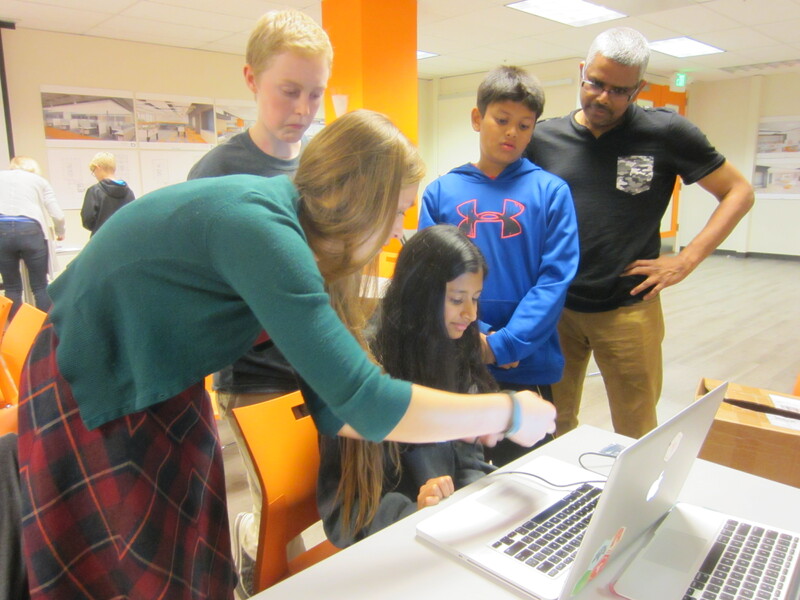 We want to give a big thanks to Kelsey of Technical Machine for giving our kids this opportunity and the folks at Veeva Systems for being a TriV host and providing us with the venue for our sessions each second Wednesday of the month. ← Everything 3D at TriV!